just finished the score for "Corners"
Just wrote the score for a compelling short film called “Corners” starring Lynn Cohen (Munich and the Hunger Games), Aida Turturro (The Sopranos) and newcomer Katherine King. It’s a very well shot, universal, thoughtful film by director Anthony Nicolau. Anthony got in touch with us after seeing us (Clare and the Reasons) play eons ago play live in St Louis… It’s funny how everything you do in life can possibly lead to an artistically satisfying experience many many years down the road. We are very happy with the score and have been grateful to Anthony for having a clear vision for what he was imagining for the score. Hello all- You’re invited to the Premiere of the Joseph Pulitzer film we scored. Lincoln Center, Walter Reade Theater. The 6pm showing will have a Q&A after with director Oren Rudavsky. We’ll be there too! There will also be a panel of journalists on Sunday, January 13th under the heading Pulitzer’s World: The Role of the Media in a Fake News Universe,” featuring Jami Floyd, host of All Things Considered, Adam Moss, Editor-in-Chief of New York magazine, filmmaker Oren Rudavsky, and Jodi Rudoren, Associate Managing Editor of The New York Times. This film turned out great. it now has the voices of Adam Driver (narrator), Liev Schreiber (pulitzer), Rachel Brosnahan (Nelly Bly), Lauren Ambrose (Kate Davis Pulitzer). 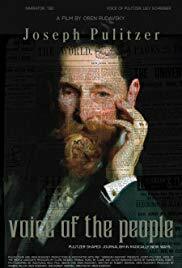 Joseph Pulitzer spoke of "fake news" over 100 years ago and fought the dangers that the suppression of news had for a democracy long before our present threats to press freedom. His heroic battles have been forgotten along with anything we might learn from the tools he deployed against his enemies. In Theatres and on PBS in 2019. French film we scored wins top prize! “L'échappée”, written and directed by Laetitia Martinoni won the top short film prize of Prix EFA Drama 2018. Loved scoring it! 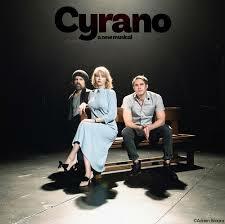 This summer Olivier got asked by the band, The National, to be the music director on a new adaptation of Cyrano- Starring Peter Dinklage. Olivier's bible as a teenager was in fact "Cyrano de Bergerac", it all felt too special to pass up. So, we loaded up the car with kids, bug boxes, venus fly traps, music gear and headed to Connecticut for the summer. I can tell you, it was loads of work, but completely worth it, for art's sake. It was an incredibly moving production and you'll be hearing more about it. Doing another commercial for Summerland Creative. Wrote a fun pop song for La Quinta CA commercial. Airing soon! We're enjoying getting immersed in writing another score for a new Oren Rudowsky film (busy guy!) This film is completely heart breaking and heart warming, all at once. We say we are mostly scoring all of it because they are also licensing some beautiful pieces from composers such as Osvaldo Golijov. The film is the about an incredible story of NYC teenagers coming together with Holocaust survivors to learn about their lives and then to stage their survival stories theatrically. To see the surprisingly deep connection between the teenagers and the survivors is a testament that we are all humans and can always try to make an effort to understand on a deeper level. It's also a reminder that these stories NEED to be told over and over, through all generations so we may never forget what really happened. Music before image! Yay for that. Just wrote an old fashioned Gershwin type orchestral score for a commercial being shot in Palm Springs next week. It has been an exciting experience to get to write and record the music BEFORE the commercial was shot. This is because all the dancers will be choreographed to our music. Can't wait to see the final cut! We'll share it soon. Enjoying writing the music for Laetitia Martinoni's short film in Paris. It's based on her own story of being a young mother diagnosed with breast cancer. It's very moving, creative and filled with great humor, all through an obviously painful situation. It's called L'échappée, hopefully it'll become a feature length, it's a bold, refreshingly honest story. Read about it more here. We're very content to be working, once again, with a very smart director, Oren Rudavsky. He has been working like mad on an incredibly interesting and timely documentary about Joseph Pulitzer. Pulitzer started the first gigantic, completely independent newspaper in the 1890's called The News Of The World. We'll keep you posted on the PBS air date. We've embarked on a new kind of project; scoring beautifully shot, scrumptious short pieces about the facial herbalist extraordinaire Tammy Fender. These are Directed by Paul Austin from the Austin Advisory Group and he knows how to make an advertising intension feel like an artistic, lush film that one gets lost in. Yes, we like scoring a short film shot in France in the Berry region set in beautiful medieval religious gardens. Yes! This powerful film got picked up by First Run Features and will be released starting with Lincoln Center on September 23rd. We had a very good time scoring this film, it was a smooth rewarding artistic process. "Colliding Dreams" out now in NY and LA. So proud to have scored it. We're getting very excited to start working on a film for American Experience produced by WGBH, to air on PBS. Details to follow, but this will be quite a dark score, and dark is good if you ask us.